Update - 2019.02.08This product has been discontinued because in 2017 Vortex revamped their Viper PST series of rifle scopes to create the Viper PST Gen II Series – check out the new series here. If you have your mind fixed on the original 6-24×50 Viper PST as of today there are still units available through online retailers such as Amazon. The Vortex Viper PST 6-24X50 FFP scope with EBR-1 MOA reticle is so featured packed it has more letters after its name than a surgeon, and every letter means something to the hunter who wants to fill his tag this season. You see that PST up there? That stands for Precision Shooting Tactical. Self-explanatory, right? Well, in case you don’t get it, it means this scope is outfitted with the best of the best in glass, reticle design, construction, and internal mechanism systems. And as for the rest of the letters, well, you’ll have to keep reading to find out what those mean. This scope has a very solid rating with over several dozen reviewers buzzing about it on independant online forums. In the world of ratings, and in this price range, that’s quite difficult to beat. But it getters better, because the Viper PST also garnered a fantastic rating of 4.9 stars out of 5 on the Vortex review page – with over 340 reviews! With the Viper’s distinctive features, it would have been a crime to not mention when reviewing the best of the best rifle scopes. While it seems to be more suited for tactical use, there are some qualities and features that earn this particular model its own review. Below in the Q&A is everything you need to know about the tactical scope that hits a home run with hunters. The FFP stands for First Focal Plane. This means the cross hair will increase in size as the target gets larger – as the magnification power increases. Sub-tension (the surface area of your target that is covered by the cross hairs) will remain the same. It also means that hunters in high-stress situations don’t have to remember what magnification to set their scope at to appropriately use the holdover data. How this scope perform in low light conditions? The Viper PST rifle scope has a few things going for it that makes it a great low light optics tool. The first is the FFP that hunters are being drawn to more and more while they pursue higher end optics. A second point is the illuminated reticle that can be turned off and on with a single click of the illumination adjustment knob to help you get precise aiming no matter what time of day it is. There are 10 different illumination intensities that you can choose from that will suit your needs best in low light conditions. It’s conveniently located at a 45 degree angle to the left of the eyepiece for easy adjustments while staying out the way of turrets and power settings. Thirdly, there is a highly visible MAG-view fiber optic that marks your magnification settings for easy reference during low light conditions. For hunters, these features allow you to prowl during those hours that animals are the most active. Does this have a wire or glass etched reticle? This Viper PST 6-24X50 FFP has a glass etched reticle that’s protected between two layers of XR fully multi-coated glass lens for ultimate reliability and durability. 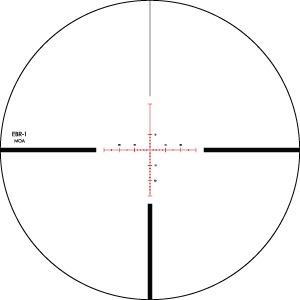 You know that this reticle won’t break, even under heavy and repeated recoil. While tactical scopes are found to have the glass etched reticle more commonly than hunting scopes, this Viper PST is proving to be the extreme long distance hunter’s dream scope. Do I need a spotting scope too? Whether or not you feel you need a spotting scope is a completely personal choice. While spotting scopes typically start their magnification power where this one ends, you’d have to ask yourself if your activities require one or not. The magnification range on this Viper 6-24X50 is on the higher end for a rifle scope. If you’re an extreme long range hunter and not a professional sniper, this high powered scope should work doubly as well as a spotting scope for your hunting needs. Is this Vortex scope waterproof? Yes! This Viper PST 6-24X50 is fully waterproof to ensure you don’t have to call it a day when the rain clouds roll in. They’re O-ring sealed to keep out water, debris, and dust to ensure maximum performance, even in the harshest conditions. The inner tube is also purged with Argon gas to prevent fogging in a wide temperature range, and it’s also got a rugged and solid construction to withstand heavy recoil, shock, and impact. Are there any other rifle scopes in the Viper PST line? There are several other models in the Viper PST line. Some of these include the 4-16X50 FFP, 2.5-10×32 FFP, 1-4X24, and the 2.5-10X44 models. They also come with various reticle options as well. This model, the Viper PST 6-24X50 FFP with EBR-1 MOA reticle, is also available with other reticles including the EBR-1 MRAD, EBR-2C MOA, and the EBR-2C MRAD. How much does the Vortex Viper PST FFP cost? The Viper PST FFP 6-24X50 can be found online for less than $1000! This price includes the premium features such as the glass etched reticle, extreme magnifying power, and everything else this scope has to boot. It’s extremely difficult to find a scope of this quality for such a good price. This street price for this tactical scope is what also makes it attractive to hunters and recreational shooters. While they look to the Viper line, they want something a little better than the standard Viper series, so they look to the Viper HS models. Some go a little further and decide on the Viper HS LR models, just to give themselves that extra long distance ranging. And, others end up asking, “why stop and settle here?”. They’d rather pay just a little bit more, but not much, to go up a notch to the PST line. You also have the super nice, but super expensive, Razor series – if you want to drop more than two grand on one. Does it have a side focus? You betcha! Since the Viper PST ranging capabilities start where parallax can become an issue, it comes with a side focus for parallax correction. The side focus knob is conveniently located on the left side of the scope which can be easily reached from shooting position. According to the bull’s-eye, your easy-to-set adjustments can be deadly accurate for your first-place shots. The Vortex Viper PST 6-24X50 is all about long range and precision. Unfortunately, it seems that there are a couple reviews about canted reticles. This happens to be extremely rare, but it’s worth mentioning since it gives Vortex a shot to redeem themselves with their superb VIP warranty. They certainly have the best customer service, hands down! If the awesome price of under 1000 bucks is still overwhelming to you, then consider the Vortex Viper 4-16X50 HS Long Range Rifle Scope. You will have to forgo the illuminated reticle, but Vortex quality is still there. Plus, with all the features the 4-16X50 has, you’d think you were buying a $1000 scope anyways. It’s a win-win. Save some money but get way more back in quality! If you wanted to know all about your alternative options, then you need to shoot by the Meopta MeoPro 4.5-14X44 HTR rifle scope review. You won’t get the illuminated reticle here either, but it’s optimal for practically anything in and between hunting, tactical, and range use. The Vortex Viper PST rifle scope is an excellent optic. We can’t overstate that you’re getting the very best for the absolute lowest price possible. You’ll be stunned by the quality just like we are. Actually, we used to be stunned by the quality, now it’s just what we expect, and Vortex has never disappointed!